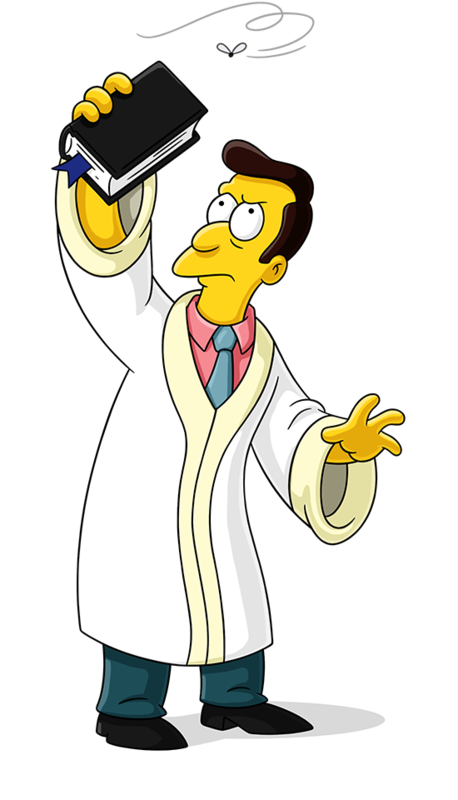 Religious leader of the First Church of Springfield. Can confidently cite the most obscure biblical passages. He's rarely at a loss for words as host of his weekly call-in show "Gabbin' About God." Says "The Church receiveth and the church taketh away" and (usually to Ned Flanders) "Have you ever considered one of the . . . other religions?" For others to read his books: "Hell: It's Not Just for Christians Anymore" and "Satan's Boners"
Bart's congregation gathers and leaves the other church in Springfield. Troy marries Selma to get into tabloids. Reverend Lovejoy gives Maude's eulogy. Homer listens to the football game while he's at church. Bart has a nightmare about killing Principal Skinner. Some Springfield residents confess in front of the congregation at church, Lisa accuses Jessica of stealing the collection money. Marge takes over for Reverend Lovejoy when he stops wanting to run the help hotline. Helen Lovejoy switches mattresses with Homer. Homer is introduced as the new deacon.